The Mac trackpad is the smooth rectangular surface below the keyboard; it’s your laptop’s answer to using a mouse. A trackpad has its own annoying idiosyncrasies. Fortunately, you can customize the trackpad to work how you want using the Keyboard and Mouse preferences. Simply choose the Apple key→System Preferences. Under Keyboard and Mouse preferences, click Trackpad. Drag the Tracking Speed slider to change how fast the pointer moves and the Double-Click Speed slider to set how fast you have to double-click. If you want to click by tapping the trackpad surface, without having to press the trackpad button, select the Clicking option. You can drag an item by tapping it twice, without having to hold down the button, by selecting the Dragging option. Using two fingers on the trackpad surface will not move the cursor when you select the Ignore Accidental Trackpad Input option. If you plan on using a regular mouse, select the Ignore Trackpad When Mouse Is Present option. If you own the newer MacBook Air, you have options to make things happen with one finger, or two, by selecting the appropriate boxes. A little video window helps you learn what to do. 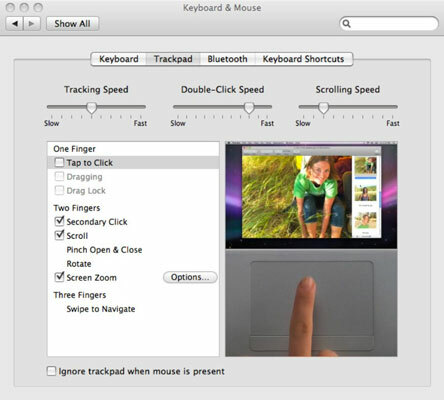 Two-finger scrolling is a relatively recent trackpad function not included on older models. A trackpad loathes moisture and humidity. If it does get wet, gently wipe it with a clean cloth. It also may refuse to cooperate if you touch it coming out of the shower or after you’ve used hand-lotions. Do not use any kind of household cleaning solution. You can still use a regular mouse with a laptop and may prefer to do so if you’re sitting at your regular desk.